It isn’t complicated to use, installs in minutes, and doesn’t require any tools for assembly. We blow up the HandiRack Inflatable Roof Rack and and test it out. What the darn heck is a HandiRack? ‘Normal’ roof racks can be cumbersome, annoying to store away when not used, and a pain to fit when you want them back on. The is an inflatable system, which has easy fitment, take up very little room and are lightweight. These are not a permanent set, and are more a temporary solution. The material surrounding the inflatable tubes is certainly tough and durable. The stuff used is actually much like a German-made inflatable boat we bought – ultra-resilient and has survived a load of heavy-use trips. A good thing. If you like high grade gear, you’ll love this product. All the straps and metal rings running down the two inflatable sections which are used for strapping your stuff down, are the same high quality, with heavy-duty stitching too. We were very happy with the materials Handiworld have used on this product, and the way it’s all put together is commendable. The guys at HandiWorld have made sure their gear is really good quality, and this is not some cheaply-made item – just the opposite in fact! As mentioned, fitment of the HandiRack is quick ‘n easy folks. We reccommed putting them on two of three times to get used to the way they work first, then they should only take a few minutes after that. The air pump is great, if a little cheaply-made, but the two-way system makes for fast inflation. The HandiRack’s deflate to super-compact size, and take up hardly any space in a car. Afraid they’ll get stolen? Simple solution: park up, take off the HandiRack, deflate them, put in the trunk. Even though they don’t look strong, this system can hold an impressive 80kg (176 lbs). We loaded them to nearly that weight, and there were no problems. The HandiRack is such a good system, but we were disappointed by a rather major flaw. After a heavy rainstorm, we found the front seats in the truck were wet, not soaked, but certain very damp. This is why; The belt that inside between the doors to hold the racks down is similar to safety or seat belt. These soak up water and that, alongside the belt nipping the door seals, makes the water run along the strap, which then drips down onto you, or your seat. If the belts were coated in plastic or rubber, this would almost certainly be the answer to stopping it. Another issue; The HandiRack left fine scratches on the paintwork of the roof. This is unfortunately normal – as detailing enthusiasts we know that even on dry, clean paintwork, rubbing anything other than a good microfibre cloth across it will cause fine scratches and swirl marks. Our answer? Put couple of soft microfibre towels the full way under each rack. Problem solved. We feel the $99.99 (dependant on reseller) for the HandiRack is almost right. The system is cheaper in the U.K. though, due to it being a British firm. We cannot quality of this system, and although there’s that water problem, they are still priced reasonably. A set of normal metal secure roof bars cost $30 – $40 more at least, but then you have to store them etc. 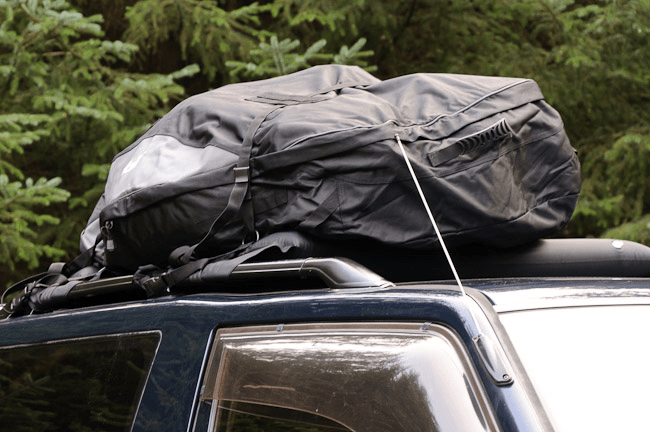 If you don’t use roof racks very often, and just want an easy solution for carrying something too large for the trunk – and also a product that’ll store anywhere – then the HandiRack will do you nicely. They’re also stylish, for you ‘boarding dudes too. If you’re planning a long trip though, a set of normal bars will be better overall. BMW's entry-level offering in the crossover lineup, we review the 2013 BMW X1 xDrive35i and realize it's one underrated compact CUV.